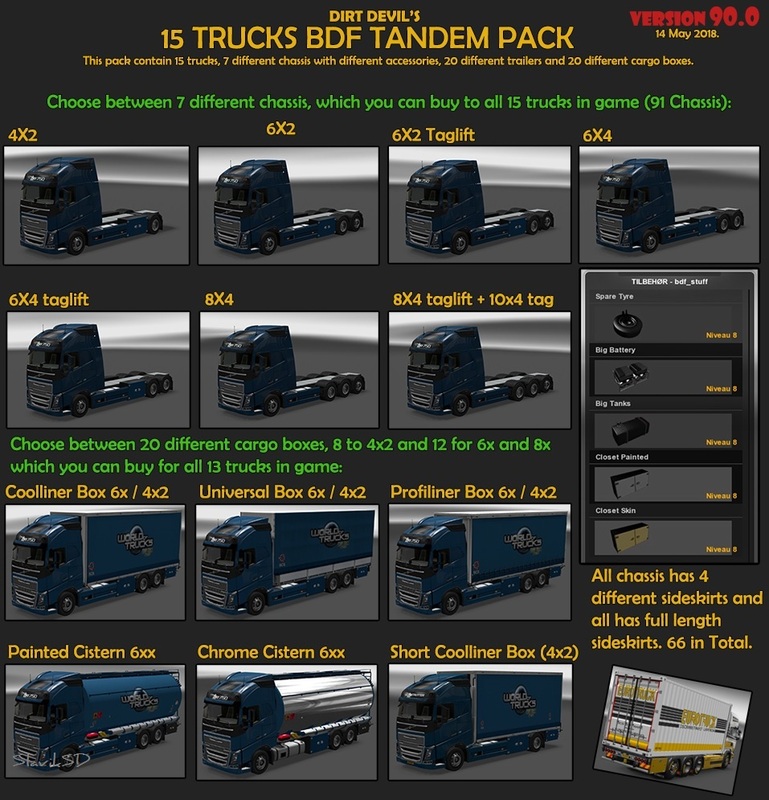 This is the BDF Tandem Truck Pack for Euro Truck Simulator 2 game. - Adjusted Shadows under Owned Dolly trailers. - Adjusted Collision boxes on all Dollys. - Adjusted cargo type in Dolly trailers. - Adjusted physics to take advantage og game version 1.33.x new physics. 5 NON Trailer Cargo versions. Hauling: flatbed, curtainside, dryvan, insulated, refrigerated. Huge thanks to jgut and InVTaR for giving me inspiration. Download it without commercials, you do not even need to wait for any countdown. No DL speed limit, no password before DL, no mod protection and of course 100% Free. This mod uses ALL the original game trucks and add tandem to them. It does not replace anything in game, only adds to the game. Truck updates from SCS will automatic be used by this mod. But some other truck mods could cause problems. Compatible with ETS2 v1.30.x and all versions after that. To drive these BDF trucks you need to go to your favorite truck dealer and upgrade a truck chassis. No trailers in the game will be replaced. Tandem and Dolly trailers will be added to ALL game cargo. At the firm entrance, you can choose by the cog which trailer you want to haul a specific cargo type with. All trailers will let you haul about 287+ different cargo types. (Including latest cargo system) and also include WOTR cargo. After Selecting Tandem Chassis 4x2, 6x2, 6x4 or 8x4 chassis use the dot just behind the cabin to add the cargo box or chassis accessories. You can paint and upgrade all truck with same accessories from the game, just like all other stock trucks in the game. Edit all the devil.dds files in your favorit DDS editor to have your own skin. Just overwrite all these devil.dds files you find, with your own skin dds colors and your are good to go. pack if you want other trailers than Coolliner trailers with and without dollys. Never have more than one trailer pack activated together. Always have main pack activated ALSO, if or when using a trailer pack from here. 3. Start the game and enter Mod Manager in your profile. Add mod to right side as active. 5. Start adding Chassis and Cargo box to your truck. To uninstall, disable the mod in the profile mod manager. Game will not crash, you will just have a stock truck if you only disable mod. No harm done. Please credit me if you are using anything in my mod, in your own FREE mod. Please don't use anything from my mod in a paid mod.